The Narendra Modi government’s move to reserve 10 percent of government jobs for poor upper castes ahead of the upcoming general elections is set to have serious political repercussions in days to come. Although the government believes the idea will help pacify the angry upper castes which have been the traditional vote-bank of Modi’s Hindu nationalist Bhartiya Janat Party (BJP), many believe this could prove counter-productive in case there was a sharp polarization of a vast Other Backward Castes (OBC) and Dalits voters against the former as was seen during the last 2015 state elections in Bihar. Upper castes constitute for roughly about 15 percent against OBCs and Dalits who form a huge 65 percent of India’s total population. The rest are Muslims (14.23 percent), Christians (2.30 percent), Sikhs (1.72 percent) and other religious communities whose population is below one percent, according to All India Religious Census Data 2011. The Modi government was compelled to make amendment in the Indian Constitution to arrange for special privilege to the upper castes after its severe electoral reverses in three key Indian states of Madhya Pradesh, Rajasthan and Chhattisgarh where the BJP lost power to the rival Congress much against its expectations. The BJP was nearly sure that the upper castes won’t ditch the party no matter they are angry with them but the poll results ended its illusion. The upper castes were angry for two main reasons—first they wanted job quotas like OBC/Dalits and secondly because the Modi government had overruled the apex court’s order which removed the strict provision of mandatory arrest under the Scheduled Caste/Scheduled Tribe Act under heavy protests from the Dalit community. Quite many allies of the BJP too had opposed the Supreme Court’s order and joined the India’s shutdown called in April last year. Fearing desertion by its allies which bank on the support of Dalit community, the government brought amendment in the SC/ST Act to overrule the top court’s order but that angered the upper caste. How the Constitution Amendment Bill was important for the BJP is underlined from that fact it was brought on the penultimate day of the current winter session of the Lok Sabha whereas the Rajya Sabha was extended by a day to table the bill. The bill was finally passed from both Houses of the Parliament in what political experts say “in a hurry”. With the provision of 10 percent reservation to its core voters, the BJP now hopes to cement its position in 14 out of total 29 Indian states where the party had made spectacular performances in the last 2014 LS polls. These 14 states account for a total of 341 Lok Sabha seats out of total 545 in the Lok Sabha—lower House of the Parliament. Of the 341 seats, some 170 to 180 seats are such where the upper castes are in decisive position and this is the reason why Modi wanted to please them by going out of the way. In the last LS polls, the BJP alone had won 140 seats out of upper caste-dominated 180 seats whereas the remaining seats were won from constituencies with mixed voters. As per an estimate, 80 percent of upper caste voters supported the BJP in the last LS polls and the party wanted to keep them intact this time against at every cost. Against this “silver lining”, there also remains the wide apprehension of sharp polarization of the vast backward and Dalit voters against the NDA for its “commitment” towards upper caste voters, experts believe. “The grant of reservation to upper caste could lead to sharp polarization of backward and Dalit voters as they now feel threats to their reservation rights and are also feeling ignored,” explained prominent social scientist Sachindra Narayan. “Upper caste people already have education, competency and intelligence, and very obviously they will climb further high now with reservation facility in hands. That means less representation of backwards/Dalits in jobs,” observed Narayan adding a sense of insecurity had already gripped this community. According to him, this could lead to “social conflict in the larger perspective”. “And, hence in my opinion the reservation to upper castes could backfire since it will give impetus to social conflicts,” he opined. Jignesh Mewani, a prominent Indian politician who led protests by Dalits, considered ‘lower castes’ in the Indian caste hierarchy, in Gujarat in 2016, too has termed this move as a “dangerous design” by the BJP government which, he fears, could ultimately end the “caste-based reservation”. “We have no objection to reservation to upper castes but the intention of BJP doesn’t look fair. We apprehend the BJP is working on the agenda of its ideological mentor, the Rashtriya Swayamsevak Sangh (RSS) to scrap the caste-based reservation,” Mewani has tweeted. He has asserted reservation is not the “poverty alleviation programme but to bring social equality in the caste-ridden society”. Experts say this kind of apprehension among the backward and Dalit class voters could have dangerous proposition as was seen in the last Bihar state polls held in 2015. During that election, a mere statement by the RSS chief Mohan Bhagwat over the issue of reservation had strongly worked against the NDA. In his observation, the RSS chief had advocated for reviewing the country’s reservation policy and the main opposition Rashtriya Janata Dal (RJD) headed by Lalu Prasad went to the voters telling them how the BJP’s ideological mentor was conspiring to scrap the reservation of the socially poor castes. The issue ultimately united the rather divided Dalits, backwards and extremely backward castes so much so that this scripted the humiliating defeat of the BJP. The strong polarisation of backward/Dalit voters against the NDA could be underlined from the fact that it could get barely 58 seats—including 53 seats won by the BJP—in 243-member Bihar assembly. The reservation to upper caste has thrown up another trouble for the ruling NDA. 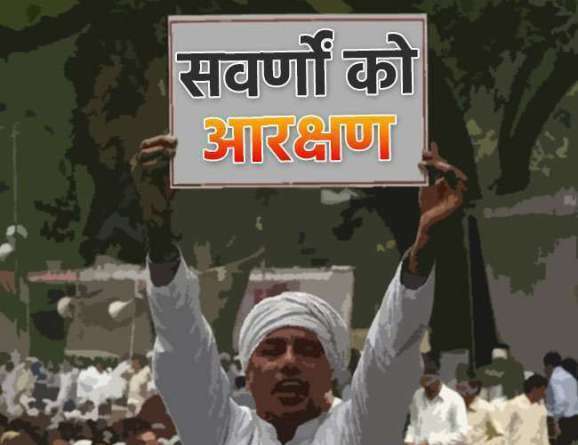 The RJD which was one of the few parties that voted against the Constitution (124th Amendment) Bill, 2019 in the Parliament is demanding for 90 percent reservation for remaining 85 percent population after the Modi government granted 10 percent reservation to upper castes. “If 15 percent population was granted 10 percent reservation, the remaining 85 percent population should be given 90 percent reservation in every circumstances,” RJD lawmaker Tejashwi Yadav has demanded. Tejashwi, son of mighty Indian politician Lalu Prasad, is the Leader of Opposition in the Bihar state assembly. He also questions the grant of reservation to upper castes. “On what basis, 10 percent reservation has been granted to upper castes. Have any commission or survey reports recommended for that? The Indian government should reveal this,” says Tejashwi.